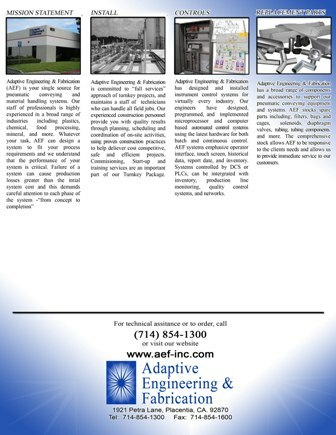 Adaptive Engineering & Fabrication (AEF) designs, engineers, fabricates, and installs pneumatic conveying and material handling systems. Our staff of professionals is highly experienced in a broad range of industries from plastics and powder, to foods and chemicals. Whatever your task, AEF can design a system to fit your process requirements while understanding that the performance of your system is critical. AEF designs systems with careful attention to each phase, from concept, to completion. The engineers and designers specialize in mechanical, structural, electrical, piping, and instrumentation, thereby providing completely engineered projects. 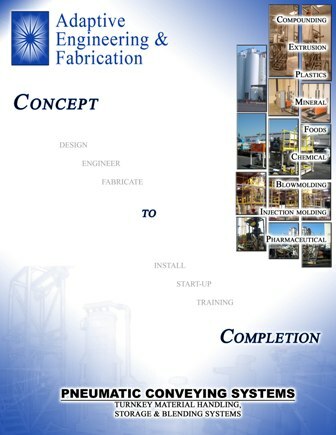 Our fabrication capabilities include structural steel, ASME code vessels, ductwork, conveyors, instrument panels, and other equipment needs. Specialty manufacturing and custom design of control/automation systems are provided as an essential part of our total package approach. 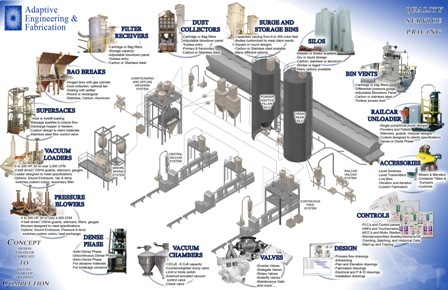 We are recognized as one of the leaders in providing quality engineered systems and full plant facilities to meet the specific needs of each unique process.